Many of us were astounded to find that, as of last night, Microsoft’s Windows 10 nagware is being installed on domain-joined computers. I’ve seen a flood of new complaints from Windows 7 and 8.1 customers -- and admins -- asking how to get rid of the Get Windows 10 icon in the status bar, how to prevent Microsoft from force-downloading 5GB of pre-installation files onto customers’ PCs, and how to keep PCs from getting locked up with a seemingly forced “Upgrade to Windows 10” notification. If you can see the Get Windows 10 icon in your system tray, Josh Mayfield’s GWX Control Panel (updated today) will delete the icon, remove and hide the offending KB patches, and perform the registry change that tells Windows 7 and 8.1 to not install Windows 10 -- but it only works if you use it early enough in the upgrade cycle. If you go into Windows Update and see a normal update screen listing important and optional updates, you haven’t been fully infected by the Windows 10 upgrade shenanigans. You can safely treat Windows Update as you always have -- which, in my case, means setting Windows Update to “Notify but don’t download,” and avoiding this month’s patches until we know more about them. If you go into Windows Update and get a screen that says “Upgrade to Windows 10” (screenshot), you may think you’re stuck -- the only update you can install is the one that upgrades the system to Windows 10. In fact, you can install any patches you like without installing Windows 10. Click the link that says "Show all available updates." Uncheck the box marked “Upgrade to Windows 10,” select (check) any updates you may want to apply, click OK, and click Install Updates. Based on tests with dozens of systems, Windows 7 or 8.1 will apply only the patches you select. It will not start the upgrade to Windows 10. To get rid of the “Upgrade to Windows 10” message, run GWX Control Panel, click the box to “Disable Get Windows 10 App,” then “Disable Operating System Upgrades in Windows Update.” The former option deletes and hides a cornucopia of Windows updates responsible for the festering mess. The latter option sets the registry key listed in KB 3080351 -- you don’t have to manually change the registry, and it works whether or not you have the Group Policy Editor. GWX Control Panel does not work if Windows Update shows the “Your upgrade to Windows 10 is ready” message (screenshot), nor if you’re getting messages that say “It’s almost time for your upgrade,” allowing you to reschedule -- but not cancel -- the update. We’ve been running a series of tests over on the AskWoody site, seeing if there’s a way to thwart late-stage forced upgrade scenarios. (I say “forced” realizing that, at some point, the Windows 10 customer may have clicked a box that offered to “Reserve your free upgrade.” Few people would expect that a one-click reservation would start you down the path of an irreversible upgrade, eh?) At this point, we have one potentially problematic solution that doesn’t work on all machines. The potentially problematic solution: Restore to a restore point prior to Sept. 15. If you’ve ever used restore points, you know that rolling back can create problems: Programs and drivers you’ve installed since the rollback point may not work, settings made in the interim generally don’t take, and other ancillary problems such as those discussed in this Lifehacker article. Windows 8.1 doesn’t even generate automatic restore points, and unless you’ve turned on the feature (one of the first steps listed in "Windows 8.1 All-in-One for Dummies"), you won’t find any restore points. The saving grace: Running a restore doesn’t touch any of your data files. Most of the time, you can go through a system restore and hardly know anything was changed. If you’re lucky enough to have a restore point dated before Sept. 15, run a restore and see if that gets rid of the “Your upgrade to Windows 10 is ready” message. If the “Your upgrade” message is gone, immediately run GWX Control Panel and get rid of all the vestiges that may be lurking. If you don’t have a restore point dated Sept. 15 or earlier, hang in there, don’t restart your computer, and let’s see if somebody can come up with a solution. Several people have noted that Windows 10 won't install unless the customer agrees to a EULA. Unfortunately, Microsoft hasn't published any information about how canceling in the middle of the upgrade works -- and it looks like your system does not go back to a pre-forced-upgrade state. By the way and for the record, I personally have upgraded my working machines to Windows 10, and it works fine. 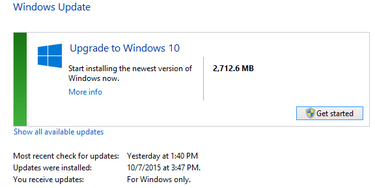 I’m not anti-Windows-10, but I’m anti-coerced-upgrading. Microsoft’s behavior in this stealthy upgrade debacle has been appalling.